Description: Ouch contains 28 white marbles, 2 blue marbles and 24 sticks. How to play - At first place the ouch, bow on a flat, smooth surface. Then use one hand to keep it steady and with the other insert the sticks from outside in. The sticks are very flexible, so you can insert them in such a way that a more testing game can be played. Insert the sticks at different heights and do not leave any gaps. Place the bases on the tray and fit the central tube in the tray hole. Afterwards assemble the tower by first inserting spiral tower 1 with slot in the tray, now fit spiral tower 2 in the tray. Fit the slope to connect the spiral tower and the base. 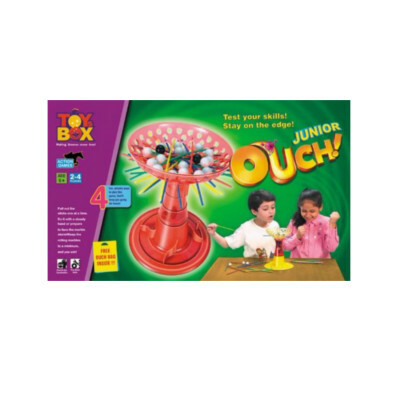 Then place the ouch, bow on the tower unit. Finally drop the marbles in the ouch bow and cover the bow with the lid.